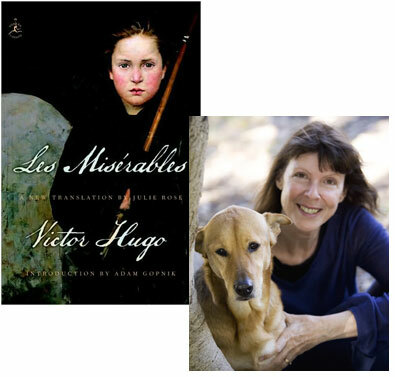 With the spectacular film version of the major Broadway musical adaptation of the English translations of the French novel playing in theaters worldwide, there’s a renewed interest in Victor Hugo’s Les Misérables. Julie Rose – the writer/translator who wrote in 2007 “the first full original unabridged translation of Victor Hugo’s epic novel” – is back on the talk-show circuit. She has spoken recently with Australia Broadcasting Company’s Margaret Throsby. If you listen to the podcast, then you hear Rose repeat how the translator finds herself in a relationship with the original author that is much like a marriage. She finds herself needing to be “faithful.” And in the Translator’s Preface, Rose says so. I was very worried about losing my hair and becoming fat which Hugo did, you know, by the time he was writing it. You almost go into a trance-like state to be able to sustain [Les Miserables]. Adding, subtracting, multiplying, dividing: maybe translating is also doing math, musical math. If so, additions need to be kept to a minimum according to the requirements of intelligibility, subtractions even more so, but the chopping up of syntax and the multiplying of sentences is often essential. With Victor Hugo’s monumental Les Misérables, I felt the need only very occasionally to add, for reasons you may well imagine, but never to subtract. In the description of the Battle of Waterloo, for instance, when Napoleon refers to his nemesis, the Duke of Wellington, as ‘ce petit anglais‘, I couldn’t stop my Napoleon from adding a noun: ‘that little British git’. Call me a jaded modern Australian, but for me, ‘that little Englishman’ just didn’t get the withering contempt with which the mere descriptive ‘anglais’, coloured by the ‘petit’, was charged in the Hugo. The Victor Hugo I came to know, a man with a great sense of humour, would have laughed, I like to think. Translators of Hugo traditionally never add, they subtract—and rather cavalierly at that. Certainly the exact nature of Hugo’s feel for the idiosyncratic and the particular, his celebration of sheer excess, is lost in the process. That’s the conclusion I reached as I read the two best-known English translations—Charles Wilburs’ 1862 version and Norman Denny’s from 1976—while I was working through the first and second drafts of my Misérables (precisely to make sure I left nothing out). Charles Myriel, nonobstant ce mariage, avait, disait-on, beaucoup fait parler de lui. Il était bien fait de sa personne, quoique d’assez petite taille, élégant, gracieux, spirituel; toute la première partie de sa vie avait été donnée au monde et aux galanteries. Those of us reading Rose’s translation are happy how she’s come to know Hugo and has shared him with the rest of us this way. I bought this translation a short while ago, but have not read it. But I was disturbed by this Amazon review. (Follow link to read it) What do you make of it? I did see the recent film, but would not call it “spectacular.” It seems even less fair to call it a “version of the major Broadway musical adaptation of the English translations of the French novel.” The musical was written in French, and Herbert Kretzmer adapted the French lyrics of Alain Boublil and Jean-Marc Natel. The production did not come to Broadway until two years after the London show began and unlike the London show, it did close on Broadway in 2003 (it was revived in 2006-2008). It is not currently showing on Broadway. You and I will just have to choose different adjectives for our opinion about the film. He is, however, very clear about his contribution. He did not merely translate Les Misérables – his French is “wretched”. 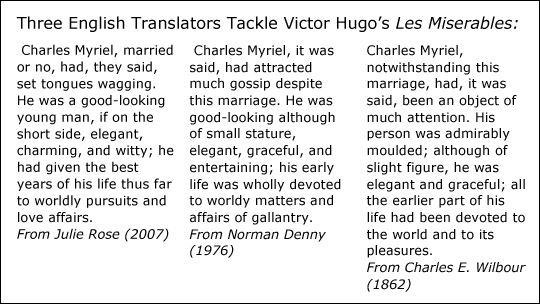 He read Victor Hugo’s novel in English and worked with a literal translation of the French libretto…. So I’ll stick by how I open my post above, if I myself was not being clear when using a synecdoche (Broadway musical) for the whole musical adaptation phenomenon.